It seems a bit serendipitous that around the time I had seriously begun thinking about tacking an ACD plan I also discovered a new gluten-free grocery store in my neighbourhood. While there is a decent selection of vegan items, I was disappointed to discover that many of them included sugar and yeast. I was really pleased, though, when I spied a bag of black bean flour from Bob’s Red Mill. Without any idea of what I would do with it, I took it anyway thinking that I could use it in much the same way that chickpea (besan) flour is used for crepes, socca, eggless omelettes, and a variety of other baked or fried tasties. The first time I used the black bean flour, I’d had guacamole-stuffed omelettes in mind. The omelettes turned out fantastically (I’d have posted a photo, but my camera chose that very moment to run out of power). What I noticed about the bean batter was that it was much thicker than either of the batters made from the chickpea and mung bean flours I’d been using. I thought, “What a great pancake batter this would make!” And indeed it did. Although it’s a bit hard to see in this photo, the pancakes turn out a vibrant shade of indigo-purple due to the black bean skins ground up into the flour. The flour isn’t cheap or easy to find (I paid about $9 for my bag), though a little goes a long way because the flour makes very dense and filling pancakes. If you happen to have a really great coffee/spice grinder or grain mill (maybe even a VitaMix would work), you could be thrifty by trying to make your own black bean flour. 1. Preheat a well-seasoned cast iron pan or non-stick pan over medium heat. 2. In a medium-sized bowl, combine the black bean flour, sea salt, and garlic. Mix the mixture with a fork to evenly combine. 4. Add the olive or coconut oil to the preheated pan. Using a 1/4 cup dry measure as your batter ladle, pour 1/4 of pancake batter into the pan for each pancake. 5. Cook the pancakes on one side for 5-7 minutes, or until the edges are a dark golden brown and the tops are just dry. Flip the pancakes over and cook another 5-7 minutes. Remove from the frying pan and serve topped with salsa, sour cream, hot sauce, guacamole, or a smoky roasted bell pepper sauce (recipe below). 6. If not eating right away, these pancakes keep fairly well in a covered casserole in the stove on a very low warming heat. 1. Using an oven-proof dish or cookie sheet, roast the bell pepper under your oven broiler until the pepper’s skin is blackened on all sides, about 20 minutes. (Remember to keep an eye on the pepper and turn it when one side is black enough.) When it’s finished, pop it into a paper bag and close the top, leaving it to sit for 10 minutes. This will allow for easier peeling of the charred skin off the pepper. 2. When it’s just cool enough to handle, stem and seed the pepper and slice it into quarters. 3. In a blender, combine the pepper, paprika, tofu, and sea salt. Blend the mixture on high until well combined and smooth and creamy. Depending on how thick the sauce is, add up to 2 tbsp of water (or more, if necessary) until you get the thickness you like. 4. Serve as a sauce over pancakes, crepes, tofu or bean flour omelettes, steamed veggies, in burritos or wraps, or use it as a dipping sauce. ← Photo Gallery: What the heck does a vegan eat on an anti-candida diet? oh great pic and tasty looking recipe – you make me want to cook these! 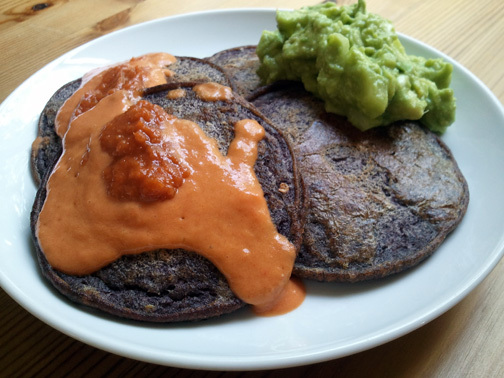 I finally got the black bean flour I ordered and I had the time to do some cooking so I made up a batch of your Black Bean Pancakes. They were wonderful! My only change was to add some vegan sour cream and roasted garlic, only because I seem to put vegan sour cream and roasted garlic into anything I can. 🙂 I wrote a post about it on my blog. Thanks for posting the recipe!